Introduction: Crossing centuries, great inquiries are still portrayed in medicine. Abnormal healing becomes one of these mysteries not completely unraveled. Keloid and hypertrophic scars are characterized by abnormal responses to the healing process. They present intense production and deposition of collagen and glycoproteins in the dermis, with consequent development of a pathological scar. Keloid and hypertrophic scars arouse an important aesthetic and psychological appeal, especially when present in regions such as the face, causing embarrassment and changes in social relationships. Due to this, when carrying out a review of the literature, there are many papers talking about the subject keloid, being at experimental or clinical level, however there is no consensus on which method is best done in its handling and treatment. Objective: Describe a new approach to keloid resection preserving its epithelium and dermis as cover in cases where transplantation would be necessary. Method: Report three cases of keloid in ear in young patients, one in the lobe and two in the ear helix, all with low or absent clinical activity (hyperemia, pain and/or pruritus and absence of growth). 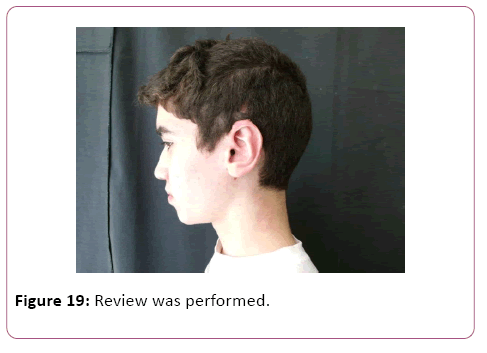 In the first case, the patient was previously treated with intralesional corticoid injections, surgical resection and radiotherapy, but recurred with keloid formation predominantly in the ear lobe. On this time, it was treated with the technique described by Kim DY et al. as keloid fillet flap added to adjuvant beta-therapy, with no signs of recurrence until the present moment of follow-up and with a tension-free primary closure. 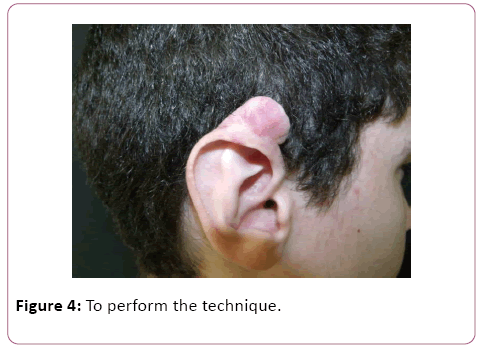 In the second case, the patient presented keloid formation in the upper extremities of ears after performing otoplasty. Such patient was treated with intralesional injections of corticoid (triamcinolone acetonide) followed by surgical procedure, also with cited technique, and adjuvant beta-therapy, providing a primary closure of the lesion without tension. The third case, reports about a keloid recurrence in upper auricular helix after two procedures of excision and local skin grafting. In this case it was also made intralesional injections of triamcinolone acetonide, followed by a surgical approach with the keloid fillet flap technique and beta-therapy adjuvant also carried out tension-free primary closure. Results: In the short follow-up period, no recurrences, suture dehiscence, hematomas / seromas, or areas of tissue necrosis were observed. Patients remain without clinical signs of keloid activity. Conclusion: Cases where clinical signs of keloid activity, hyperemia, pruritus, local pain and growth are not observed, as well as areas where there is no possibility of primary closure after complete resection, including large masses, conservative surgical approach provides a very pertinent alternative. Techniques that cause minor morbidities to the patients and preserve the local anatomy after resection of the lesions and that do not increase the rates of recurrence and/or complications, are portrayed as ideal. Thus, these reports corroborate a new approach to some forms of keloid lesions with the objective of better patient outcomes and without the need for skin grafts or distant flaps. From pre-enlightenment age, where science had not yet been forged and non-habitual phenomena were explained by the sphere of mysticism, abnormal healing mechanisms were part of the culture of certain peoples. Framing such a scenario, in the pre-Columbian era the Omelca people of Mexico used scarification and consequent abnormal scarring as a means of embellishing their bodies and also social identification. By historical reports, the keloid was described by Egyptian surgeons in 1700 BC. After a few centuries, the French physician Jean-Louis Alibert (1768-1837) found a high scar formation in the year 1806 and called this form of chancroid. Subsequently, to avoid the carcinogenic connotation, it changed the name to keloid. The noun "keloid" is derived from the Greek khélê: "tweezers, jaws", compounded to the suffix "- oid", from the Greek: eîdos: "appearance, shape", denoting a scar-like "pincer" shape. It is still unclear whether the main mechanism of keloid generation is increased synthesis or reduced collagen reabsorption, this is caused by a decrease in the production of collagenase or a direct inhibition of such enzyme. The combination of these two mechanisms can be considered the reason for the histopathological findings found in the keloids . Another important cell in the formation of the keloid is the keratinocyte. Studies have reported that, through paracrine effects, keratinocytes act on adjacent fibroblasts promoting greater proliferation and less apoptosis of these [2-5]. However, the mechanisms responsible for keloid genesis are not fully understood. Due to incomplete knowledge of the factors that stimulate and trigger the formation of abnormal scars, there are in the literature treatment methods, none of them being ideal for keloid management. They include intralesional injections of corticosteroids (IC), 5-fluorouracil, interferon alfa/gamma, bleomycin or verapamil, use of topical clobetasol, gel or silicone band, immunomodulators, retinoids and onion extract, cryotherapy, radiotherapy, use of earrings pressure, ligation of sessile keloids and pulsed light laser among others [6-9]. Among the surgical procedures, as possibilities, we can mention the ligation of pedicled keloids, the total exeresis of the lesion and the technique described by Kim DY et al. named keloid fillet flap . This article presents case reports conducted with a treatment still underused, aiming to contribute to this multiplicity of existing techniques, aiming for a lower recurrence and a better evolution for patients with keloid. Level IV: Evidence obtained from multiple time series with or without the intervention, such as case studies. Dramatic results in uncontrolled trials might also be regarded as this type of evidence. 2.1 FBP, 20 years, male, single, native and coming from São Paulo, with a history of keloid in the left ear lobe started in 2009. He reports that one year after undergoing an earring on left ear lobe, he presented growth of a nodule on the back of the lobe. He describes that the nodule had a constant growth. At the time, he looked for a medical service in which intralesional corticosteroid injection (triamcinolone acetonide) was started. It evolved with a decrease in the volume of the lesion, and the excision with ten beta-therapy sessions was then performed as adjuvancy. The patient was asymptomatic until the year 2010, when presented recurrence of the lesion. This time he sought the Plastic Surgery Service of the Paulista School of Medicine (EPM), where he was given intralesional injection of seven sessions of corticoid and subsequent surgical procedure with beta-therapy adjuvancy. The last corticoid application was at February, 2012, with reduction of keloid volume. A medical history the patient denied allergies and other cases of keloid in the family, in addition to other comorbidities. Physical examination showed a tumor in the left ear lobe, apparently in a subdermal plane with a dimension of approximately 2.5 x 2.0 x 1.5 cm (Figure 1). 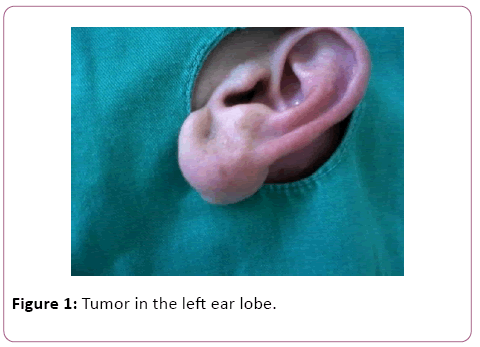 Figure 1: Tumor in the left ear lobe. 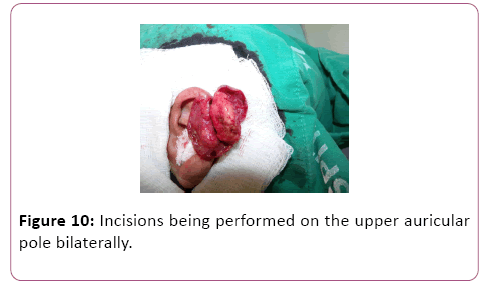 After evaluation and consent of the patient, it was decided to perform the excision of the lesion preserving the skin over the mass of the keloid, because this apparently appeared in a subdermal plane and had a large proportion, causing great damage to the ear if totally removed. 2.2 GSC, 14 years, male, single, native and coming from São Paulo, presenting a history of upper ear injury bilaterally after otoplasty surgery seven years before. Patient, in clinical history, had no comorbidities or addictions. He reports that, after three months of the operation, the tumor growth in both upper poles of the ears began. He sought the service of the Paulista School of Medicine (EPM) in March, 2012. As a therapeutic plan, the intralesional injection of corticoid (triamcinolone acetonide) was delineated in a total of four sessions, performed sequentially in each month, the last being on June 21, 2012. Patient evolved with decrease of lesion size, but no resolution. As such, new planning was done: exeresis with adjuvant beta therapy. As the local of keloids did not present post-resection primary closure conditions (Figures 2-5), it was decided to perform the technique mentioned above, the fillet flap technique, aiming at smaller aesthetics sequelae and a better overall patient outcome. Figure 2: Post primary closure conditions. Figure 3: Fillet flap technique. Figure 4: To perform the technique. 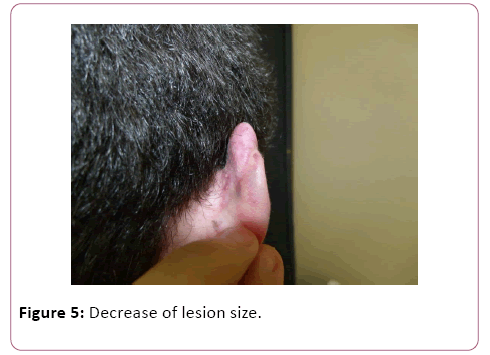 Figure 5: Decrease of lesion size. 2.3 MBA, 53 years, female, married, native of Bahia and coming from São Paulo. She presents a history of mass in the left ear lobe at age 19 at an ear piercing site. She performed a surgical procedure, in his home state, at age 22 with resolution. Later, at age 30, she presented the appearance of keloid in the upper helix of left ear, 12 months after a new hole was made for earring. This lesion presented slow growth. At 50 years, the patient performed a new surgical procedure with exeresis of keloid and local skin graft. After 2 years, it presented a recurrence of keloid at the same place of upper helix. During that time, she was sent to Plastic Surgery Service of the Paulista School of Medicine (EPM), in which the intralesional injection of triamcinolone acetonide was scheduled in three consecutive monthly sessions, with the last injection at June 26, 2012. Subsequently surgical excision with adjuvant beta therapy was performed. Healthy patient with no morbid antecedents, denying other cases of keloid in the family. On physical examination, she presented lesion in the upper left helix, with involvement and deformity of the auricular cartilage. Figuration of region with skin hypertrophy in previous graft area (Figures 6 and 7). Figure 6: Region with skin hypertrophy in previous graft area. Figure 7: Region with skin hypertrophy in previous graft area. 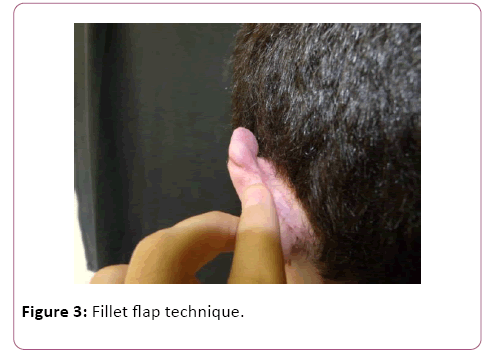 Due to such characteristics of dimensions, location and structural alterations of the auricular pavilion, which would not allow an excision with primary closure, besides being a case of relapse, it was decided to perform a surgical approach by the technique of the keloid fillet flap for a better aesthetic result and minor surgical sequelae. Written informed consent was obtained from the patients (adults) and from parent/guardian of 14-year-old male patient for publication of these case reports and any accompanying images. After obtaining the consent form, patients were referred to the surgery center, positioned in horizontal dorsal decubitus position. In sequence, it was performed antisepsis and placement of sterile fields, anesthetic block with Xylocaine® 2% of left ear in cases 8-9 and bilaterally in case 2.2. For case 8, an incision was made in the posterior region of the left ear over the keloid mass, and two skin flaps were made, one anterior and the other posterior (Figure 8). The same was done for case 2.2, with the nuance of the incisions being performed on the upper auricular pole bilaterally (Figures 9-12). In case 10, the incision was made in the upper margin of the keloid with dissection to the auricular scapha (Figure 10). Figure 8: An incision was made in the posterior region of the left ear over the keloid mass. 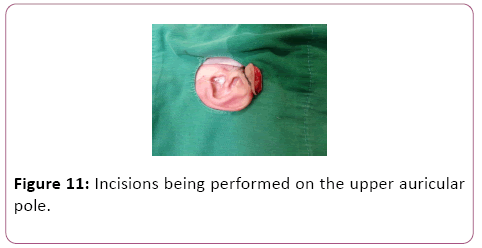 Figure 9: An incision was made in the posterior region of the right ear over the keloid mass. Figure 10: Incisions being performed on the upper auricular pole bilaterally. Figure 11: Incisions being performed on the upper auricular pole. Figure 12: Incisions being performed. 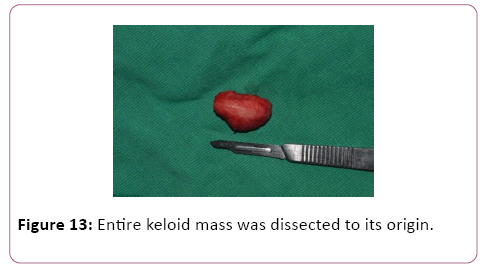 In all described cases the entire keloid mass was dissected to its origin and the mass was completely removed (Figures 13-17). 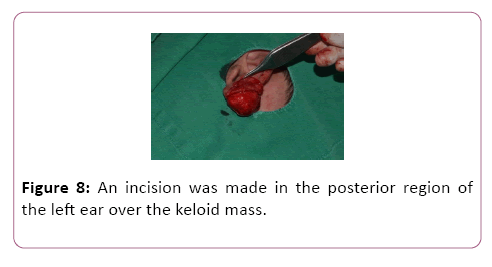 Figure 13: Entire keloid mass was dissected to its origin. 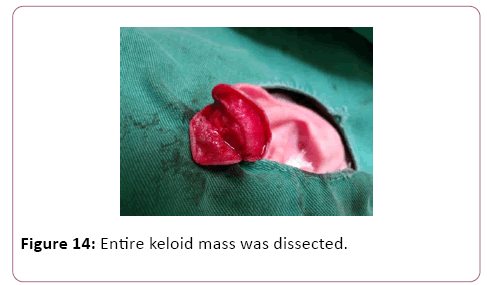 Figure 14: Entire keloid mass was dissected. 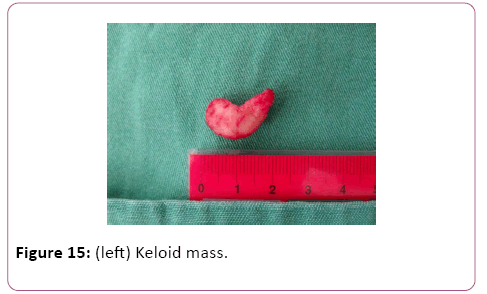 Figure 15: (left) Keloid mass. Figure 16: (right) Keloid mass of left ear. 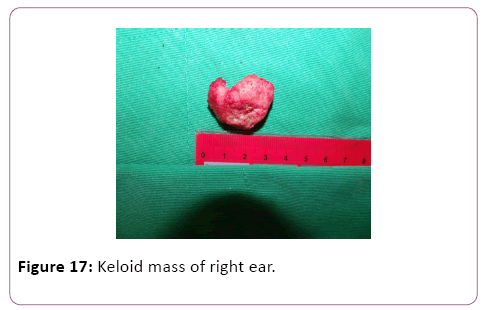 Figure 17: Keloid mass of right ear. At the end of the above-described procedure, a rigorous hemostasis review was performed to initiate closure. Due to the excess of tissue, it was decided to adjustment and resection of part of it. The closure was done with Mononylon 6.0 in separate single points (Figures 18-22). 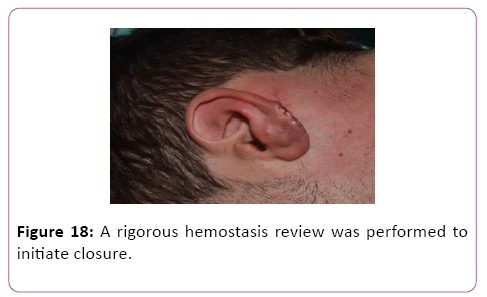 Figure 18: A rigorous hemostasis review was performed to initiate closure. Figure 19: Review was performed. Figure 20: The closure was done with Mononylon 6.0 in separate single points. Figure 21: A compressive dressing was made. 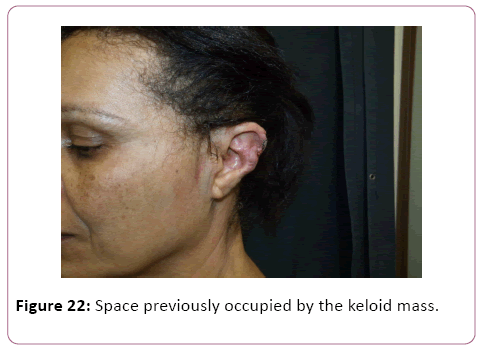 Figure 22: Space previously occupied by the keloid mass. To complete the procedure, a compressive dressing was made with the intention of avoiding the formation of seroma in space previously occupied by the keloid mass and the patients were referred for beta-therapy on a later day. In the short period of follow-up, no seromas were formed after the removal of the compressive dressing, no tissue necrosis, no suture line dehiscences or local infections occurred. Among abnormal scars, keloids represent one of the greatest challenges. It presents higher incidences in blacks, Hispanics and Asians, with this varying from 4.5 to 16% 1,6. As symptoms, they can cause pain, pruritus, numbness and redness at the site of injury and affect the self-esteem and quality of life of the patients significantly [11-14]. In terms of treatment methods, isolated surgical excision presents recurrence rates ranging from 45 to 100% [7,15]. Outlining the other means of treatment, they are: intralesional corticosteroid injection, compression, beta-therapy irradiation, laser, cryotherapy, silicone band [16-17]. At present, keloid located in the ear lobe, has as its methods of treatment the surgical excision associated to intralesional injection with corticoid or associated with radiotherapy . With the adjuvancy of corticoid therapy, recurrence rates ranging from 3 to 45% are found in the literature . In this article, the technique described by Kim DY with adjuvant beta-therapy was used, due to the fact that the keloid mass was at a subdermal level or in a region without enough tissue for primary closure, making it difficult to perform the classic resection procedure . In this article, the author presents eight cases of keloid in the ear lobe, seven of which are recurrent. It confirms, by performing only the surgical procedure, the recurrence in four cases, which were treated with corticoid application for three weeks. Of these, two cases presented resolution and two remained with small soft nodules and without growth. Such technique presents rates of recurrence within the literature standards, framing a good option for large keloids or in areas with little tissue for primary closure after resection, avoiding the need for flaps and greater surgical trauma. In the above-mentioned cases, the first with subdermal localization of the keloid mass and the second with lesions in regions of little tissue for primary closure, aiming at non-recurrence and lower morbidity to the patient, the keloid fillet flap technique associated with the adjuvant treatment of beta-therapy was performed, with good evolution and good aesthetic result at the present follow-up time. It should be noted that, for greater success, in the sense of non-recurrence of keloid in the surgical tactic called keloid fillet flap, the keloid should not be in clinical activity (presenting hyperemia, pain and/or pruritus and/or referred growth and/or ulcerations), or with poor activity. As today is increasingly clarified the interrelationship between keloid and sympathetic sensory innervation this tactic, when leaving the skin flap thin, makes it denervate and with less trophic potential, which favors the non-recurrence of the keloid. It is also known that the most proliferative fibroblasts in the keloid are those at the periphery of the lesion and the deepest ones, which are eliminated in this surgical tactic, theoretically corroborating the indication of this approach [20-24]. Cases in which no clinical signs of keloid activity are observed: hyperemia, pruritus, local pain and growth, in addition to areas where there is no possibility of primary closure after complete resection, including large masses, the surgical approach mentioned above, provides a very pertinent alternative. Techniques that cause less morbidity to the patients and preserve the local anatomy after resection of the lesions and that do not increase the rates of recurrence and/or complications, are portrayed as ideal. In this way, reports previously described, corroborate a new approach to some forms of keloid lesions with the goal of better patient outcomes. Berman B, Maderal A, Raphael B (2017) Keloids and Hypertrophic Scars: Pathophysiology, Classification, and Treatment. Dermatol Surg 1: S3-S18. Funayama E, Chodon T, Oyama A, Sugihara T (2003) Keratinocytes promote proliferation and inhibit apoptosis of the underlying fibroblasts: an important role in the pathogenesis of keloid. J Invest Dermatol 121: 1326-31. Ogawa R, Akaishi S (2016) Endothelial dysfunction may play a key role in keloid and hypertrophic scar pathogenesis - Keloids and hypertrophic scars may be vascular disorders. Med Hypotheses 96: 51-60. Xia W, Phan TT, Lim IJ, Longaker MT, Yang GP (2004) Complex epithelial-mesenchymal interactions modulate transforming growth factor-beta expression in keloid-derived cells. Wound Repair Regen 12: 546-56. Xia W, Phan TT, Lim IJ, Longaker MT, Yang GP (2006) Differential transcriptional responses of keloid and normal keratinocytes to serum stimulation. J Surg Res 135: 156-63. Lee HJ, Jang YJ (2018) Recent Understandings of Biology, Prophylaxis and Treatment Strategies for Hypertrophic Scars and Keloids. Int J Mol Sci 19: E711. Watson D, Panuganti B (2017) Treating Scars in the Auricle Region. Facial Plast Surg Clin North Am 25: 73-81. Wong TS, Li JZ, Chen S, Chan JY, Gao W (2016) The Efficacy of Triamcinolone Acetonide in Keloid Treatment: A Systematic Review and Meta-analysis. Front Med (Lausanne) 3: 71. Thierauf J, Walther M, Rotter N, Scheithauer MO, Hoffmann TK, Veit JA (2017) Treatment of ear keloids: algorithm for a multimodal therapy regimen. Eur Arch Otorhinolaryngol 274: 3859-3866. Kim DY, Kim ES, Eo SR, Kim KS, Lee SY, Cho BH (2004) A surgical approach for earlobe keloid: keloid fillet flap. Plast Reconstr Surg 113: 1668-74. Ogawa R (2017) Keloid and Hypertrophic Scars Are the Result of Chronic Inflammation in the Reticular Dermis. Int J Mol Sci 18: E606. Srivastava S, Patil AN, Prakash C, Kumari H (2017) Comparison of Intralesional Triamcinolone Acetonide, 5-Fluorouracil, and Their Combination for the Treatment of Keloids. Adv Wound Care (New Rochelle) 6: 393-400. Furtado F, Hochman B, Ferrara SF, Dini GM, Nunes JM, et al. (2009) What factors affects the quality of life of patients with keloids? Rev Assoc Med Bras 55: 700-4. Furtado F, Hochman B, Farber PL, Muller MC, Hayashi LF, et al. (2012) Psychological stress as a risk factor for postoperative keloid recurrence. J Psychosom Res 72: 282-7. Mankowski P, Kanevsky J, Tomlinson J, Dyachenko A, Luc M (2017) Optimizing Radiotherapy for Keloids: A Meta-Analysis Systematic Review Comparing Recurrence Rates Between Different Radiation Modalities. Ann Plast Surg 78: 403-11. Hochman B, Locali RF, Matsuoka PK, Ferreira LM (2008) Intralesional triamcinolone acetonide for keloid treatment: a systematic review. Aesthetic Plast Surg. 32: 705-9. Ogawa R, Akaishi S, Dohi T, Kuribayashi S, Miyashita T, et al. (2015) Analysis of the surgical treatments of 63 keloids on the cartilaginous part of the auricle: effectiveness of the core excision method. Plast Reconstr Surg 135: 868-75. Shin JY, Lee JW, Roh SG, Lee NH, Yang KM (2016) A Comparison of the Effectiveness of Triamcinolone and Radiation Therapy for Ear Keloids after Surgical Excision: A Systematic Review and Meta-Analysis. Plast Reconstr Surg 137: 1718-25. El-Kamel MF, Selim MK, Alghobary MF (2016) Keloidectomy with core fillet flap and intralesional verapamil injection for recurrent earlobe keloids. Indian J Dermatol Venereol Leprol 82: 659-65. Hochman B, Nahas FX, Sobral CS, Arias V, Locali RF, et al. (2008) Nerve fibres: a possible role in keloid pathogenesis. Br J Dermatol 158: 651-2. Ogawa R. (2008) Keloid and hypertrophic scarring may result from a mechanoreceptor or mechanosensitive nociceptor disorder. Med Hypotheses 71: 493-500. Akaishi S, Ogawa R, Hyakusoku H (2008) Keloid and hypertrophic scar: neurogenic inflammation hypotheses. Med Hypotheses 71: 32-8. Tucci-Viegas VM, Hochman B, França JP, Ferreira LM (2010) Keloid explant culture: a model for keloid fibroblasts isolation and cultivation based on the biological differences of its specific regions. Int Wound J 7: 339-48. Supp DM, Hahn JM, Glaser K, McFarland KL, Boyce ST (2012) Deep and superficial keloid fibroblasts contribute differentially to tissue phenotype in a novel in vivo model of keloid scar. Plast Reconstr Surg 129: 1259-71.